Jordair Jett's averages this season of 10.9 points, 4.9 assists, 3.5 rebounds and 1.5 steals all are the best in his four seasons at SLU. ST. LOUIS — Jordair Jett’s dreadlocks are longer and his beard a bit fuller but otherwise, he looks the same as a senior guard as he did as a junior guard. His game has changed, though, and for that, the Saint Louis Billikens should be quite pleased. If Jett had not stepped up his game this season, the Billikens (12-2) would have at least one more loss. 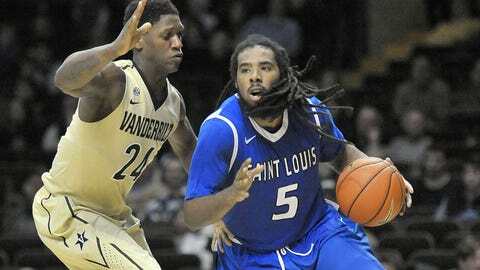 Without his 17 points and eight assists Monday night, the Billikens would not have beaten Vanderbilt. Jett has been anything but a one-game wonder, too. After serving mostly as a sixth man and defensive stopper last season, Jett has become SLU’s top playmaker and second-leading scorer behind Dwayne Evans. A case could be made, in fact, that Jett has been the team’s most valuable player as it prepares to finish the non-conference part of its schedule Saturday afternoon against Yale. His averages of 10.9 points, 4.9 assists, 3.5 rebounds and 1.5 steals all are the best in his four seasons at SLU. "He has come up big for us," Evans said Friday before Saint Louis’ practice. "His decision-making has been a lot better than the past couple of years and he’s been aggressive to score, which is something we have really needed." After losing Kwamain Mitchell and Cody Ellis, their second- and third-leading scorers, Jett knew he would be expected to produce more offense and play more minutes this season. To prepare, he spent the summer focusing more on conditioning than he had during any of his off-seasons on the Midtown campus. Twice a week when the Billikens lift weights, Jett has been hitting the treadmill. He also started checking in with a nutritionist to be sure he was helping himself off the court. "It’s all paying off," he said. "I feel like I’m a lot better. I’m more aggressive on offense and defense. I feel quicker, faster and stronger. That’s going to make it tough on the opposition." Listed at 6-1, 215, it’s no surprise when Jett powers past an opposing guard on drives to the basket. But he also has been able to blow past many smaller opponents with deceptive quickness as well as an ability to finish with his left hand even though he’s right-handed. He scored no fewer than four baskets against Vanderbilt on left-handed layups. "That’s my strong side," he said. "If I can get left, I’m a lot more comfortable." While his field-goal percentage is down to 47.5 percent from 51.1, Jett still is shooting better than the other Billikens’ starters. Subtract his dismal 3-point percentage (22.2 on 4 for 18) and Jett’s field-goal percentage rises to 52 percent. As the leader of a defense that is forcing 15.4 turnovers a game, Jett scores most of his points in transition. On a team also known for its unselfishness, he says he’s not worried about scoring. Still, he smiles when he says coach Jim Crews actually put in a new play for him this week. "That made me happy," Jett said. As well as he’s been playing, he should be. ** Yale (5-6), off since Dec. 20, has lost its past two games but one of those was a tight 76-74 setback at Providence. This will be their eighth game on the road this season. ** One of the Bulldogs’ starting guards is 6-4 junior Javier Duren out of Oakville High. He leads the team in average minutes per game (31.2) and is second in scoring at 14.4. Little used center Will Childs-Klein, a 6-11 junior, went to Ladue High. ** The Billikens, winners of six straight, open Atlantic 10 Conference play Tuesday night at Rhode Island.